1. The Swamp Ghost DVD Has Arrived! This month's update cover the history of a single aircraft wreck, a B-17E known as 'The Swamp Ghost' Over the eight year of maintaining PacificWrecks.com, I am most often asked: What is the most impressive wreck? And, how can a person visit these wrecks? 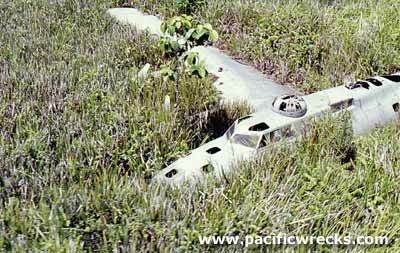 In my opinion, the most impressive Pacific wreck - in terms of history and its condition is the B-17E known as 'The Swamp Ghost'. Since its rediscovery in the 1970's many have caught the spell of this ghost. Some have hoped to salvage it, others simply marvel at the idea of an intact WWII bomber left exactly as the war left it. I too caught its ghostly spell, and traveled half way around the world to find it for myself, and then to meet its former crew members and conduct new research about it. The result of this project, I would like to present in this special update and announce the release of the new 'The Swamp Ghost' DVD. Also, for the first time in history, an opportunity exists for anyone to visit the wreck as a tourist. Join me on the adventure of a lifetime, to visit the wreck with the cooperation of the local people, while enjoying the comfort of a world class Wilderness Resort. Order Now & Free Shipping! In conjunction with the DVD release is a new website dedicated to the history and legacy of this wreck. Learn more about each of the crew members, its history and also view samples of the DVD including a trailer and special 'then now' montage. We believe that the truth about this remarkable wreck and opportunity to experience it should be available for anyone learn more about. Watch this site for new updates and information, coming soon. Have you ever dreamed about seeing the most remarkable WWII aviation relic in the world, and experiencing an unforgettable adventure in the process? For the first time his history since the bomber's rediscovery in 1974, a partnership exists to bring tourist to the site, with the cooperation of the local people, and to stay at a world class wilderness resort in the process! Sign up now for our summer trip! Are you in the Los Angeles area? Join me at the air show at the Pacific Ghosts booth, our third year in a row! Join us at our Pacific Wrecks booth, with friends Bruce Fenstermaker and other special guests. See you on the flightline!